I loves me some Five Guys burgers. Over the last few years my dislike of fast food grown exponentially. When Five Guys opened in my neighborhood I completely swore-off all the rest. Now on to their Android application. 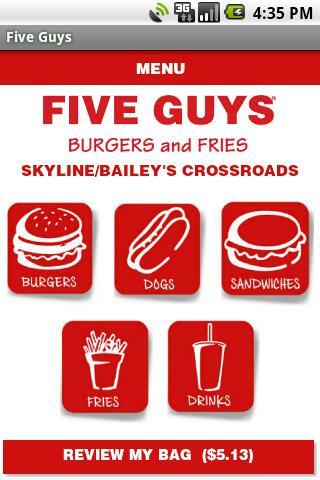 Five Guys may serve food that is typically found at fast food joints, however their food is anything but fast. A visit there takes about 30 minutes from order to departure if you sit down and eat. This is largely because it takes some time for them to cook your food. The app lets you simply place your order, tell them what time you want to eat, and pay for your food. I lost track of time this evening doing research on LED lighting for a new project I’m working on. When I finally realized I hadn’t had anything to eat in hours I didn’t want to cook or clean, so I tried out the new app. I figured I could get dinner and a blog post out of it. It works as advertised. You can quickly place an order, and completely customize your burger with any topping. The app is intuitive, and easy to follow. I went out of my way to try to break it, adding and removing items to see if it would cause a glitch in the system. It never stumbled. When I showed up to get my food they were just finishing it up. After I ordered my cheeseburger & fries it pushed me to a payment screen before I could order a drink. I had to go out of my way to add the drink to the order. It wasn’t a big deal, but I’m always surprised when a website or application makes me go out of my way to give more money. The smart bastards at Five Guys figured out how to make it easier and faster to acquire their food. That means that I need to increase my willpower to avoid their damn store. All jokes aside, there’s nothing major wrong with this app. If you like Five Guys, but don’t always have the time to wait in-store, this app is a great way to speed up the process. Practice safe eating! Remember to exercise regularly, and enjoy Five Guys in moderation. App tested on a first generation Droid. Really glad you liked the app, and thanks so much for taking the time to review it! Our team had a great time working with Five Guys & OLO, and we were especially excited to be able to launch on Android first. I wanted to chat about a couple of your feedback points, to hopefully improve your next experience and get some more targeted information. The app is designed to prompt for payment once you hit the “place your order” button. Is this not how it worked for you, or can you make a suggestion for how we can improve this? Also, any thoughts you have about how to make navigating to all the menu items are appreciated. Currently, we try to keep “back” and “menu” buttons on the screen, for people who don’t automatically use their device’s native back button. During the many rounds of A/B testing during beta, the “may we suggest” prompt (that you can ask to never see again) came up if you went to review your bag, and didn’t have fries, a drink, or both (depending on what was already in your bag). Testers determined to drop the drink only prompt if you already had fries in the bag. Would it be helpful if we turned that back on? Thanks for taking the time to read and reply to my review. I went back to the app this morning to verify my experience, and I figured out the source of my bit of trouble. On the menu pages where the user adds items with custom toppings, the button at the bottom of the screen is “add to my bag” (Burgers, hot dogs, etc). On the menu pages where the user adds items without custom toppings (fries & drinks), the app just lets you hit plus or minus buttons to add them, which works well, but the buttons at the bottom of the screen on those pages are “menu” & “review my bag.” This second method is fine as well, but the unexpected UX change caused me some confusion as the first section trained me to act in one way, and the next wanted something slightly different, yet visually similar. My recommendation would be to make the buttons at the bottom of the screen identical regardless of the item the user is adding. That will make the experience very predictable and user-friendly. As far as the extra prompts, I’m indifferent. I can see why some people would want it, and some wouldn’t. All-in-all, it’s a great app. Yeah – so you order & add toppings to a single burger, and when you’re done with your creation, you need to choose to add it to the bag. But for fries and drinks, you want to be able to add multiples of them from a single screen, hence the plus & minus. It would be a small personal hell for me to be only able to add one drink at a time. Since you’re updating your bag while you’re hitting the plus/minus, we can’t actually prompt you to add it, because if you choose not to hit an “add” button, you might not realize it’s already in there. So, we update the $ total at the bottom, try to give visual options where you can go next, and heavily exercised the native back button to get it to work in an expected manner. Potentially adding in that “you forgot a drink” prompt after hitting the review button from the fries page could make this a faster experience for you. But I think you get how it all works. It’s hard to strike the right balance when you’ve got items that work differently. Thanks so much for evaluating the app, and for giving us some detailed feedback to work with. I appreciate it!! Perhaps making the “menu” button wider and switching it’s position with “review my bag” would help. The point is that after I add fries I want to go back to the menu, not to checkout. 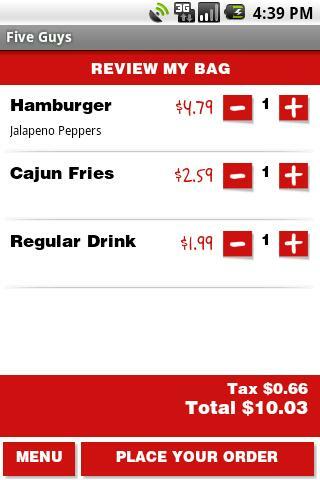 Or after adding fries it could take you directly to the drinks page, and the drinks page could take you to checkout. Oh, I’m getting this app tonight. And a cheeseburger (minus the grease?) tomorrow. Thanks for the review! I’m an assistant manager of five guys in fresno ca and a customer came in and told me about the app. Immediately I downloaded it. It’s so exciting to see we are popular enough do an app! Five Guys? Yup…..there’s an app for that!